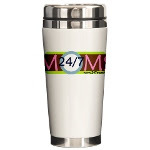 Put your kids to bed - Grab a hot cup of your favorite beverage - Put on your P.J. 's - Surf over to http://www.247moms.com/ and join us. Tweet, TXT, Facebook , invite all of your MOM friends to this weeks 24/7 MOMS Live webcast. (MOM TV Show on your computer).